SDSU Wins Challenging Road Victory in OT at Utah St. Although stressing out the fans, SDSU pulled through and prevailed in a tough road victory at Utah St.
Utah State had a fully packed house to host #7 SDSU, and I was honestly impressed with their fans. The Mountain West Conference has plenty of strong home field advantages and Utah State is apart of that. Their fans did an unclasp, yet San Diego-esque taunt of the opposing team when they sung the Aztecs “I Believe” chant. We believe a little more, Utah State. It was a gritty and tough win, but SDSU prevailed. Good teams seem to win close road games. The Aztecs were leading by 4 at half time, 28-24, but got beat 33-29 in the second half to force overtime. The game was close the entire second half, and for a period of time late in the second half, the Aggies held onto a 4 point lead. For some reason when I was watching this, it still seemed as though the game was in SDSUs hands. Although not in control, it seemed still controllable. SDSU pulled ahead in the final minutes to take a 57-54. Xavier Thames missed a late free throw that would have put the game away for good. Spencer Butterfield, on the Aggies, hit a phenomenal three point shot with 2.5 seconds left in the game over two defenders. It was honestly a terrific shot and you have to give all the credit to the kid. Josh Davis and J.J. O’Brien were in his face playing smothering defense and yet he somehow was able to drain the 3. The Aztecs did not panic. They went on to outscore Utah St. 17-12 in the extra period. Xavier Thames had 10 points in overtime. For the game, Xavier Thames beasted and was ultra-clutch. He scored 31 points, setting a new career high. Thames really had a complete game as he also managed to haul in 3 rebounds, 4 assists, 3 steals, and 1 block. He shot 3-6 from 3-pt (10-21 total), including a dagger that seemed to put the game away in overtime. 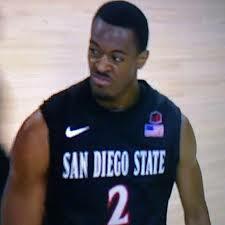 SDSU led 61-60, and Thames drained an extremely deep three that put the Aztecs up 4. After that, Utah State was pretty much forced to foul. Thames also contributed 8-10 from the Free Throw line, with a handful coming in overtime. This seems to be how the season has gone though. When SDSU has a close lead late, they hold on with the almost-automatic free throw shooting from Thames. The win was not pretty by any means, but it is a win. Road victories in conference play are hard to come by, so SDSU should not feel disheartened by ‘barely’ beating the Aggies. This win shows America that SDSU will keep fighting to get a win and will excel with the play of Xavier Thames and their swarming defense.